CHRISTMAS SPECIAL! The DJI Mavic Pro is a small yet powerful drone that turns the sky into your creative canvas easily and without worry, helping you make every moment an aerial moment. CHRISTMAS SPECIAL! Its compact size hides a high degree of complexity that makes it one of DJI's most sophisticated flying cameras ever. The DJI Mavic Pro delights by easy handling, high versatility and a tremendously good transport capability. DJI Mavic Pro even costs less than a comparable DJI Phantom 4 - highly recommended! At the end of September 2016, the leading drone manufacturer presented another compact and versatile beast drone model – DJI Mavic Pro . Various flight functions with an integrated 4K camera, a revised image transmission system and numerous safety features characterize the DJI Mavic Pro. What more does the Mavic suitcase hides – find out in our article. The DJI Mavic Pro takes hardly any more space than a water bottle in the folded transport mode. This makes it the most compact DJI model. Thanks to its telescopic legs and foldable propeller, DJI Mavic Pro is versatile and easy to use – especially when compared to the DJI Phantom 4. The DJI Mavic Pro is significantly smaller in the transport mode. The weight of Quadrocopter is just 743 grams (incl. Battery, Propeller and “Gimbal Cover”), which makes it an absolute lightweight model for its category. The design of the DJI Mavic Pro is downright new and has little or nothing in common with the exterior of the DJI Phantom models. In laboratory conditions, the DJI Mavic Pro reached a flight time of around 27 minutes – in reality, it can fly approximately 20 to 25 minutes, depending on the way of flying and selected flight modes. The 3,830 mAh strong battery 3S (11,4V) is a common DJI supplied battery and has a LED bar showing the current energy level. A spare battery is not included and it costs around 100$. It can be ordered as a regular model and it costs around 1000$. 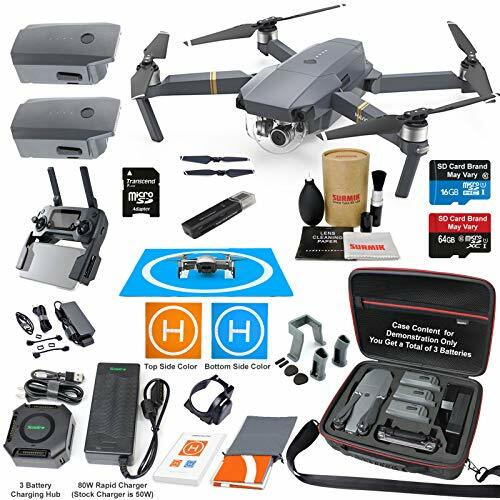 DJI also offers a bundle that costs more and includes among others a backpack, a car charger, two additional batteries, a desktop charger and an extra set of spare propellers. 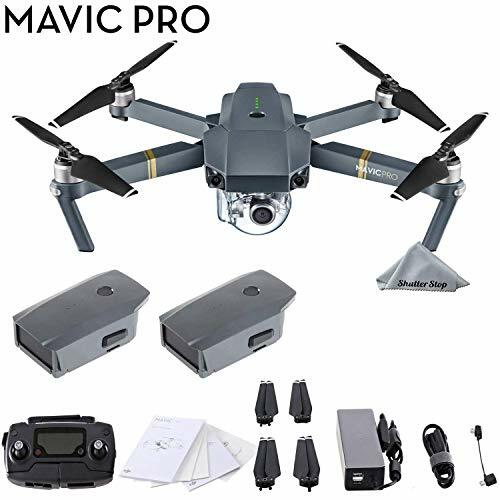 DJI Mavic Pro is considered to be an entry-drone but is an attractive model even among professional models, with its black, downright professional and quality looking housing. 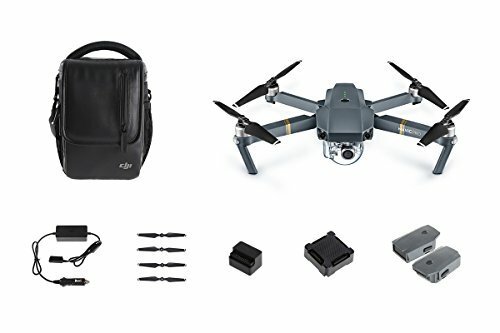 In the folded transport mode, the DJI Mavic Pro measures only 83 mm in height and width and 198 mm in length – dimensions that make it possible to fit Mavic in a jacket pocket, trouser pocket or handbag. Mavic Pro is a mere one-sixth of the size of the DJI Phantom 4. This pocket-sized model is an ideal fit for travellers, leisure activities or on the next summer party. The 8.3-inch propellers do not even have to be dismounted and DJI redefined the term “Ready To Fly Quadrocopter” once again. You can control your DJI Mavic Pro exclusively via smartphone ( “Fly by Phone”), by phone and controller or ultimately only with a matching controller. The option of smartphone-only control is a new thing in the DJI world. Much the same to toy and hobby drones à la Parrot Bebop 2, the DJI GO App provides virtual control stick so that the drone can be controlled by a finger slide, provided that the actual controller is not available. When controlled via smartphone, you will have the usual flight modes (TapFly, Trace, Spotlight, profiles, Circle) at disposal. You can record photos and videos without a controller and only with phone. Just like with with DJI Phantom 4, DJI offers a sport mode with Mavic Pro as well, which can be activated via special switch on the controller. In Sport mode, the DJI Mavic Pro achieved top speeds of up to 65 kilometers per hour, which makes this compact Quadrocopter almost a racing drone. Another new feature is the DJI Mavic Pro Tripod mode: In tripod mode, the maximum speed is reduced to only 3.6 kilometers per hour, and the sensitivity of the remote control signals is set to a maximum. Thanks to the intelligent sensors, the DJI Mavic Pro floats extremely accurately in this mode, making the Tripod mode particularly suitable for recording landscapes and indoor flights.